The Samsung Galaxy J7 2018 could be the latest model to hit the stores. The smartphone manufacturer has managed to attract a huge crowd with their J series smartphones which are affordable yet very reliable in terms of hardware specifications. Every year, the company releases a bunch of phones in the J series with slight improvements when compared to the previous models. The Galaxy J7 Star and the J3 Star were previously spotted but this time, the Galaxy J7 2018 edition makes a surprise entry in the series. The J7 which got revealed a day ago in GeekBench listing has now been spotted in the WiFi Alliance official page. The models that have acquired the WiFi certification are SM-J720F, SM0J720M, both Single SIM and Double SIM variants. Going by the trend of releases so far, it looks like these could be the Galaxy J7 2018 editions that will soon be out in multiple regions. Spotted earlier in GeekBench results, the specifications of the Samsung Galaxy J7 2018 have already been officially confirmed. The model was listed as the SM-J737P and it was first spotted by Mobiel Kopen. The model number has been confirmed to be the one for Galaxy J7, which sports an impressive specs sheet. 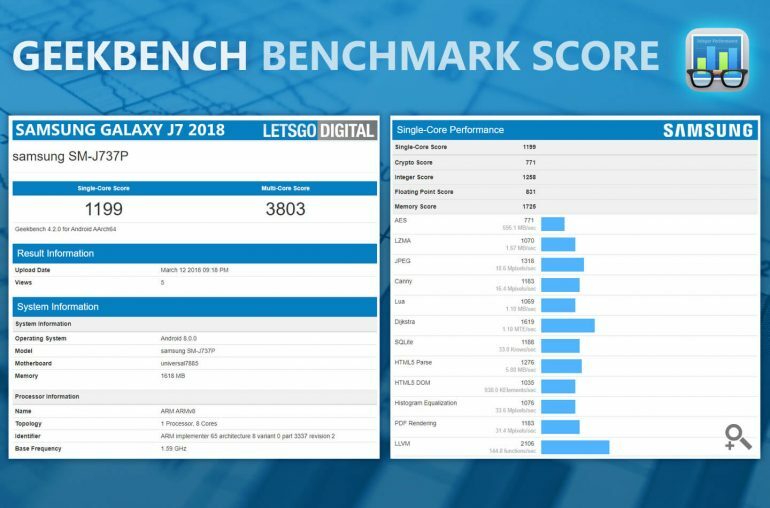 The Samsung Galaxy J7 2018 edition is powered by a 1.59GHz octa-core ARM processor based on the GeekBench specs sheet. Analysts predict that Samsung uses Exynos processors in their devices, this one could be the Exynos 7875 which is already being used in the top of the line Galaxy A8 model. Buyers will be able to choose between a basic variant with 2GB of RAM while another variant with 3GB of RAM and increased storage space will also be offered. The phone will run on Android 8.0 operating system out of the box and will sport a compact 5-inch AMOLED display with 1920×1080 resolution. The mid-range smartphone has a 13-megapixel rear camera but it doesn’t have a dual camera setup. Considering the price point of the phone, it’s not surprising to see Samsung make the decision. A similar 13-megapixel camera is also used in the front for selfie photos. The phone is powered by a 3,600 mAh battery which should easily last an entire day of moderate usage. Samsung will be releasing a couple of Galaxy J series smartphones and their 2018 variants are expected to have improved hardware specifications. After the Galaxy J7, the Galaxy J3, Galaxy J4, and J6 models are also expected to be launched. An inside source also claims that the manufacturer may come up with a Galaxy J8 and Galaxy J8 Plus editions which will be the most expensive variant in the J series smartphones with the latest hardware. These two models will be aimed towards budget buyers who want uncompromised performance. Black Ops 4 to Be Released in 2018?